‘Fruit very like the Beurre d'Aremberg, but larger, more oval, not so turbinate in its shape, about four inches long, and three inches and a half in diameter. Eye small, -deeply sunk, in an uneven oblique hollow. Stalk an inch long, rather deeply inserted in an oblique cavity. Skin pale dull olive green, a little inclining to yellow, and covered with numerous grey russetty specks, with russetty blotches round the stalk. Flesh whitish, firm, very juicy, but a little gritty at the core. Ripe in November, and will keep till February or March.’ [George Lindley – Orchard Guide p.400/1831]. ‘This old winter pear is nearly lost to cultivation, but is worth growing because of the high quality of the fruit and because the pear comes in season in early winter when there are few others. 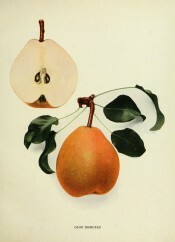 The pears are not attractively colored, although in this character the illustration does not do the fruit justice. The fruits are rich and sugary without the least trace of acid, but when poorly grown are often astringent. All agree that the quality is better in fruit from dwarf trees in which form the variety grows very well; and that it is better, also, when grown on heavy soils than on light ones. The fruits keep and ship remarkably well. The trees are neither very large nor vigorous, but are usually productive. The variety is in disrepute in many localities because the crop does not always ripen well. The Abbe of Mons, M. Hardenpont, a pioneer in pear-raising and a worthy forerunner of Van Mons, raised this pear from seed about 1750 in his garden at Mons, Belgium. The variety was introduced into France in 1806 by Louis Noisette, who had found it in the gardens of the Due d'Arenberg. In France it was known, therefore, as Beurré d'Arenberg, and consequently became much confused with the true Beurre d'Arenberg raised by Monseigneur Deschamps [which see]. In order to overcome this confusion the name of the variety raised by M. Hardenpont was changed by a number of prominent Frenchmen to Beurre d'Hardenpont, but the variety has always been grown under both names in France. In 1820, M. Parmentier of Enghien, Belgium, sent this pear to England under the name Glou Morceau. (Glou, in the Walloon language, meaning delicious or dainty; morceau, French, morsel or bit; hence, the translation may be Delicious Morsel or Dainty Bit.) Glou Morceau has long been the popular name of the variety in England and America although, as Bunyard says, "It is regrettable that the memory of the pioneer of Pear raising, l'Abbe Hardenpont, is not commemorated in this fruit." Glou Morceau was brought to America within a few years after its introduction in England and rapidly found favor here as attested by leading American pomologists. In 1862 the American Pomological Society added the variety to its catalog-list of fruits under the name Glou Morceau as it has since remained.’ [Pears of New York p.172]. It is figured as ‘Goulu-Morceau’ in Le Jardin Fruitier du Muséum [JFM vol.2/1859]. Listed only in the 1857 catalogue in an Addendum as ‘Glout morceaux’ [Pear no.59/1857]. ‘59. Hardy, poor bearer. very [2 words undeciphered].’ [Diary B, MP A2951/1862]. Obtained from Veitch’s Nursery, probably the original Exeter premises. See also Pyrus communis L. var. ‘Beurré d’Hardenpont’.